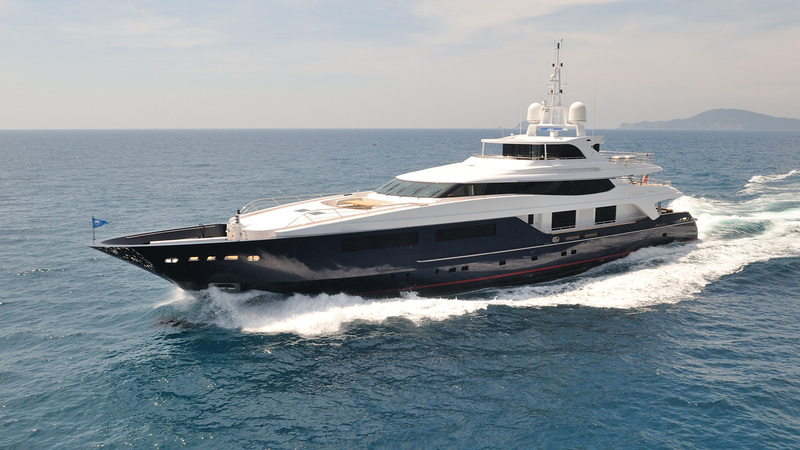 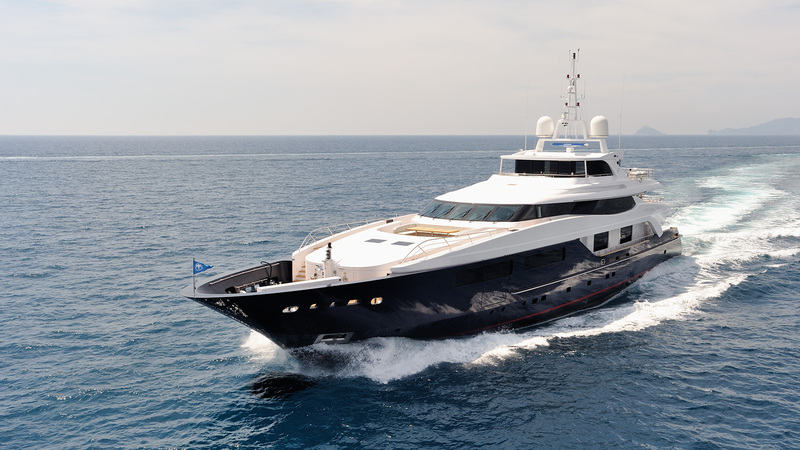 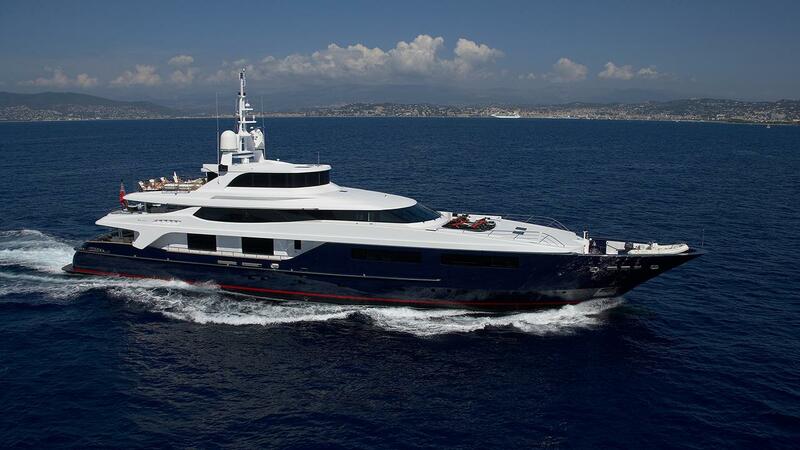 The 54m/1772ft displacement superyacht was built in 2011 by Baglietto, who also completed her naval architecture. 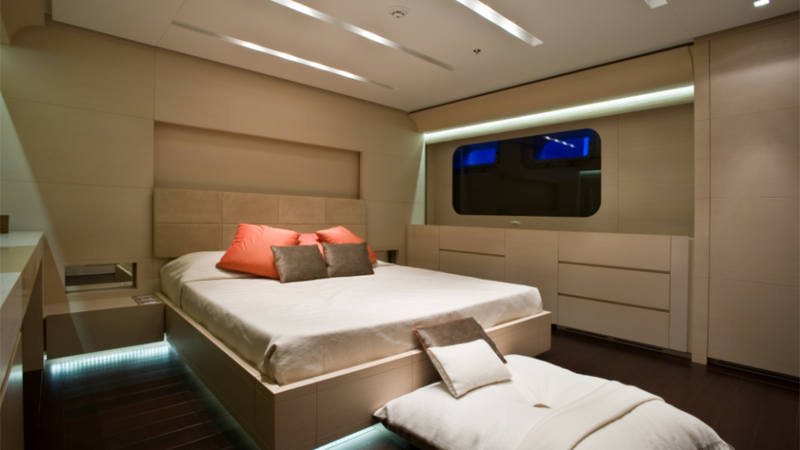 Francesco Paszkowski produced her interior and exterior styling for a cohesive appearance throughout. 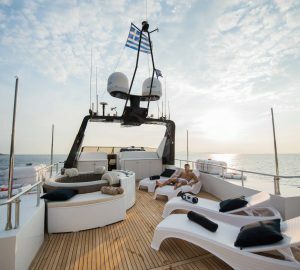 The yacht offers unique and unforgettable charter experience thanks to such amenities as a sauna, massage room or the gym, with accommodation sleeping up to 10 guests over five cabins. 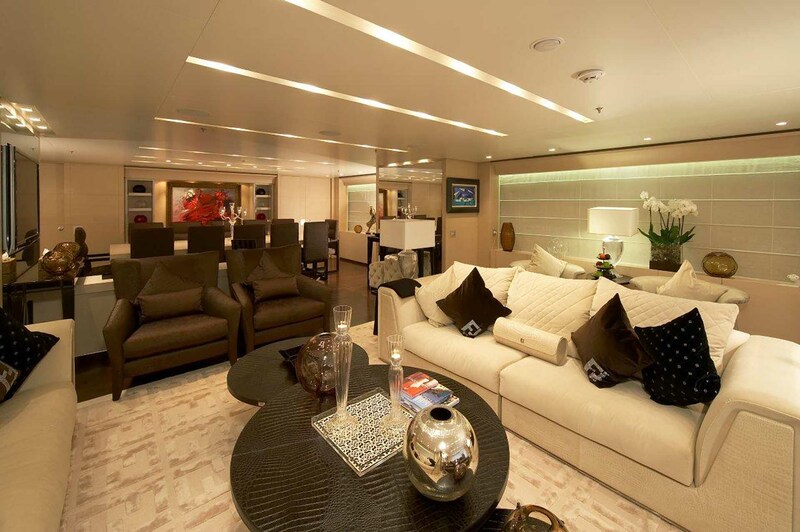 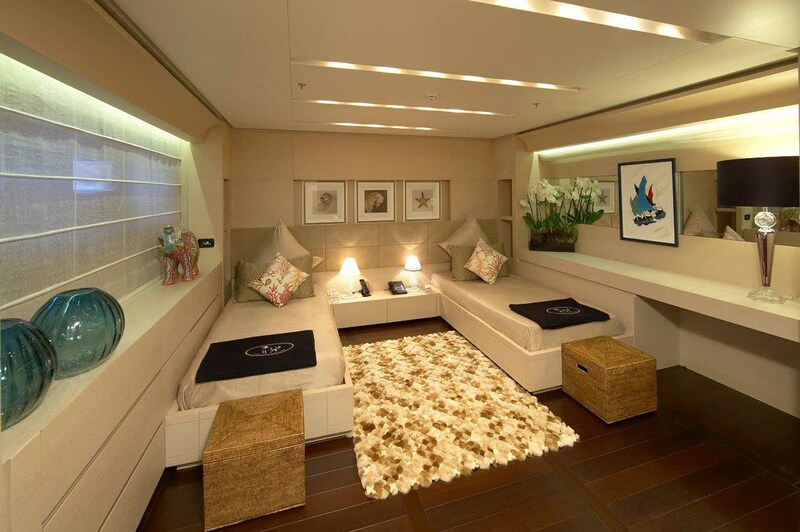 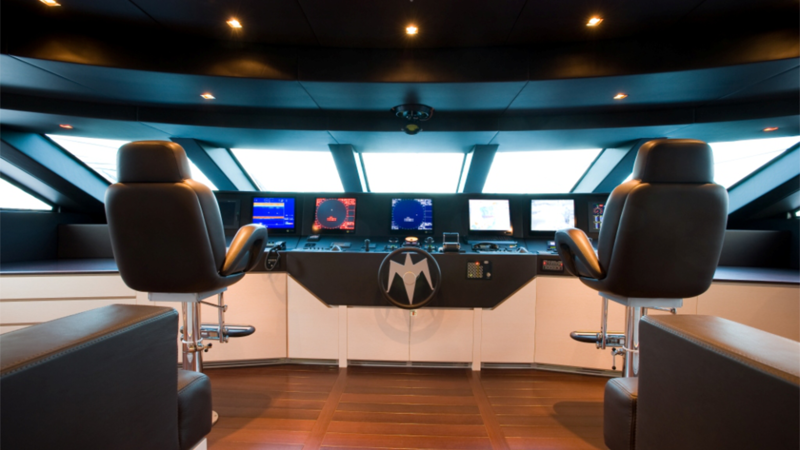 The main deck aft is fitted with a spacious exterior lounge consisting of four large sofas surrounding a coffee table. 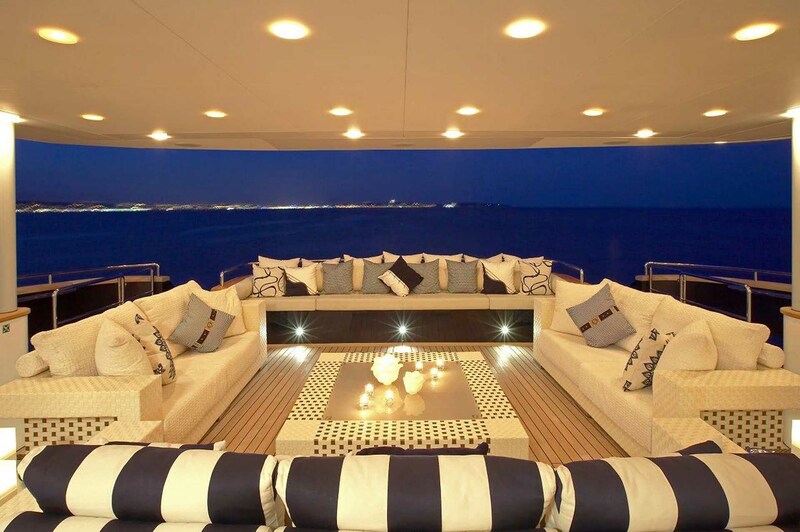 The area is ideal for outdoor socialising in the shade with uninterrupted views out across the sea. 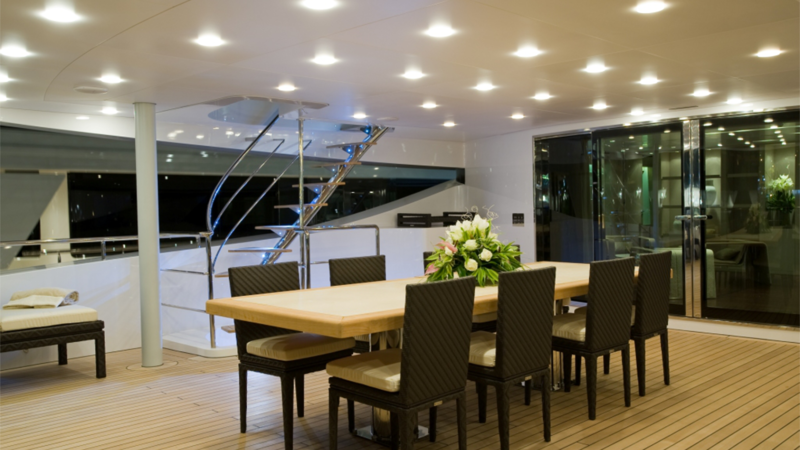 Two staircases connect down to the swim platform, where guests can sunbathe or access the tenders and water toys. 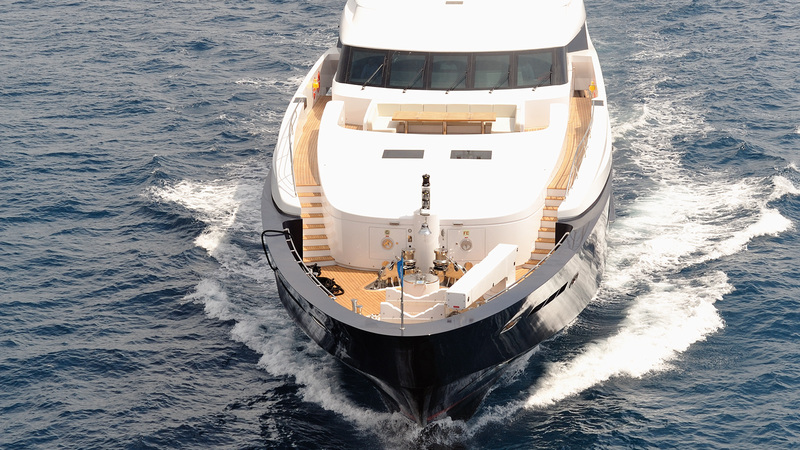 The bow is used for storing tenders and water toys such as jet skis to leave additional room on the lower deck for indoor guest usage. 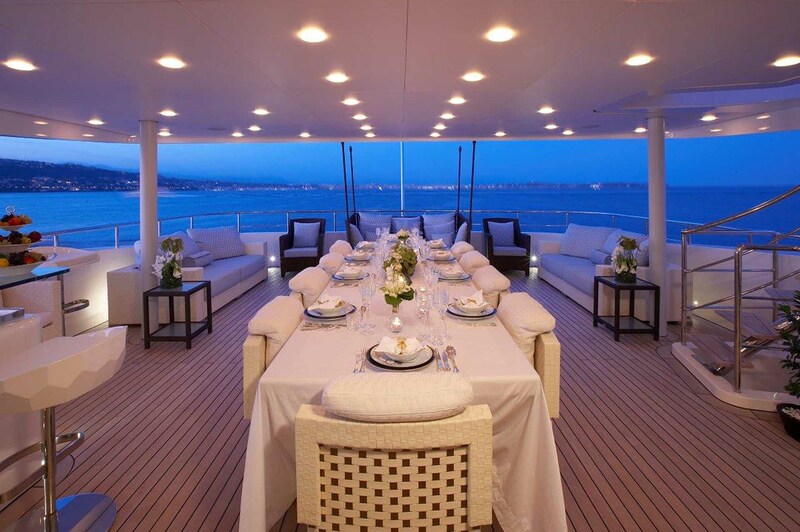 An alfresco dining table with 10 seats is located on the upper deck aft and a bar is located adjacent in order to offer efficient service to guests throughout the meal. 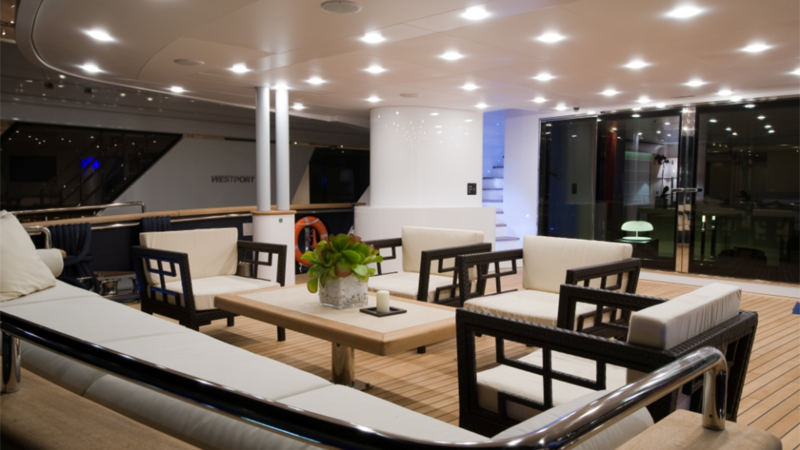 Along the port and starboard sides and around the stern there is an alfresco lounge where guests can rest after a hearty meal. 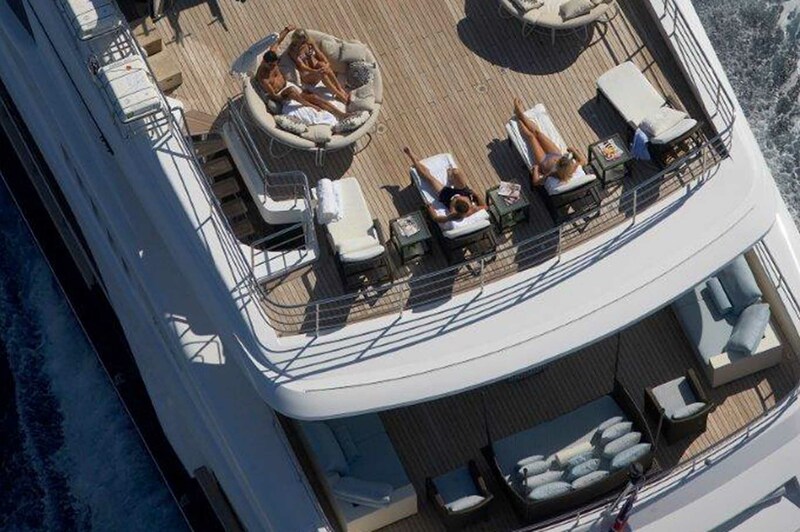 A staircase leads up to the sundeck, where four sun loungers, two oversized armchairs and a starboard-side Jacuzzi receive all-day sunshine. 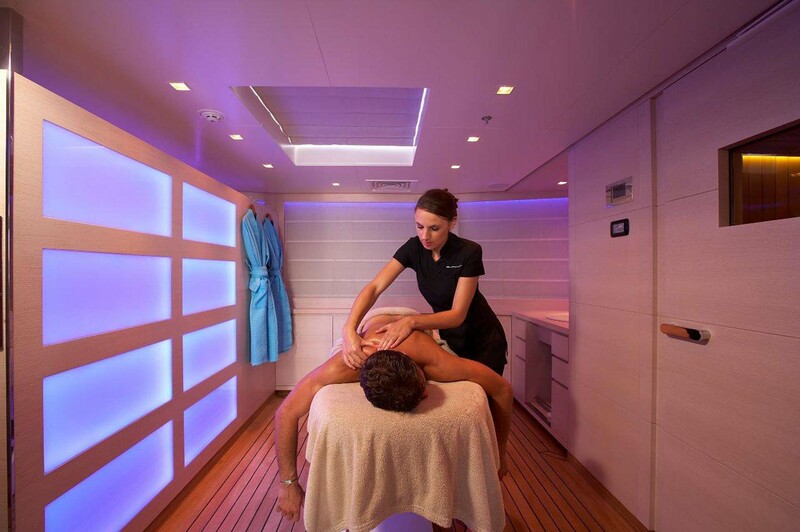 There is also a fully equipped gymnasiums and a spa centre, which includes a sauna, pedicure/manicure area and a massage zone. 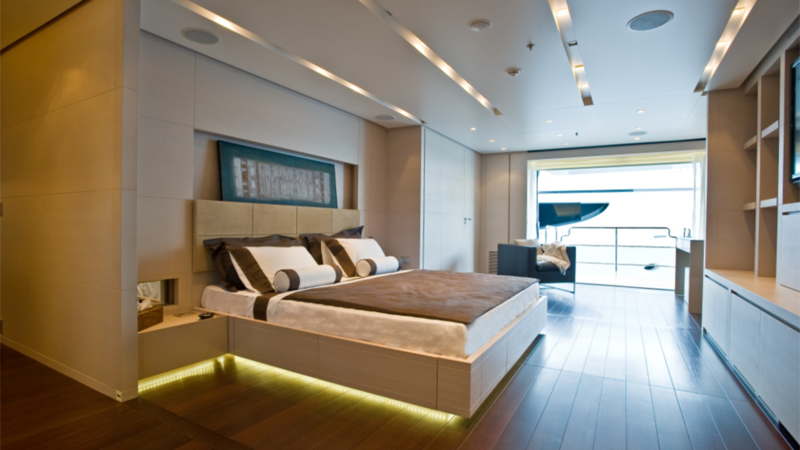 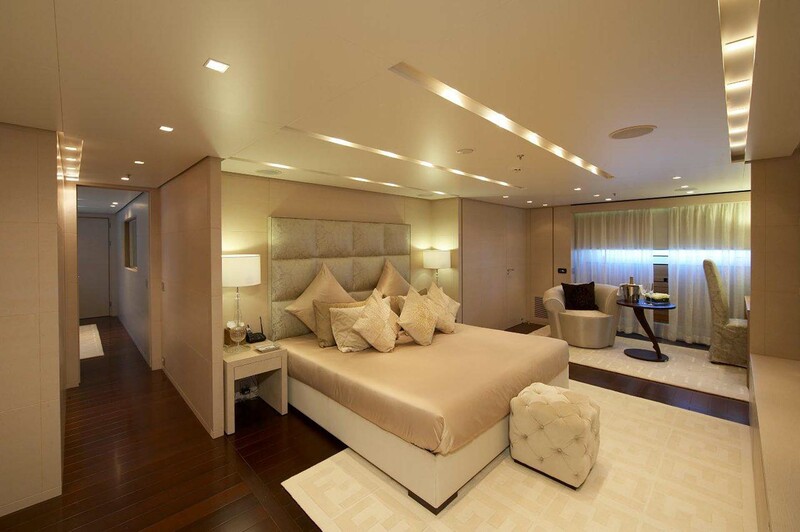 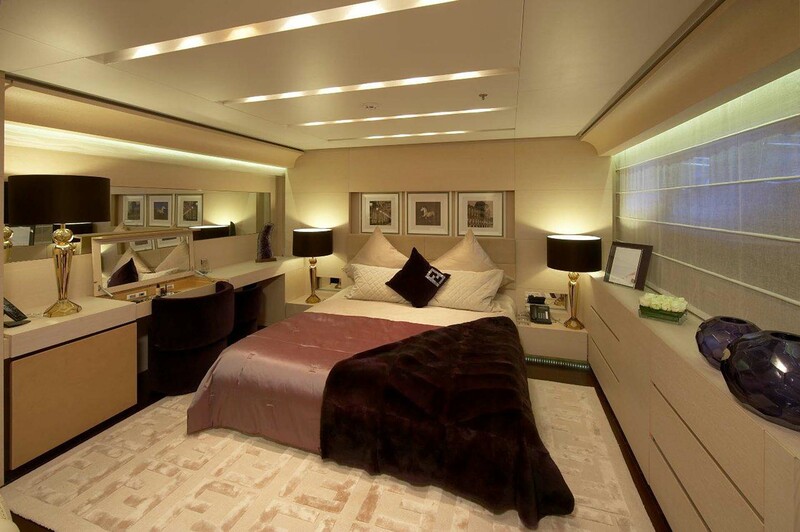 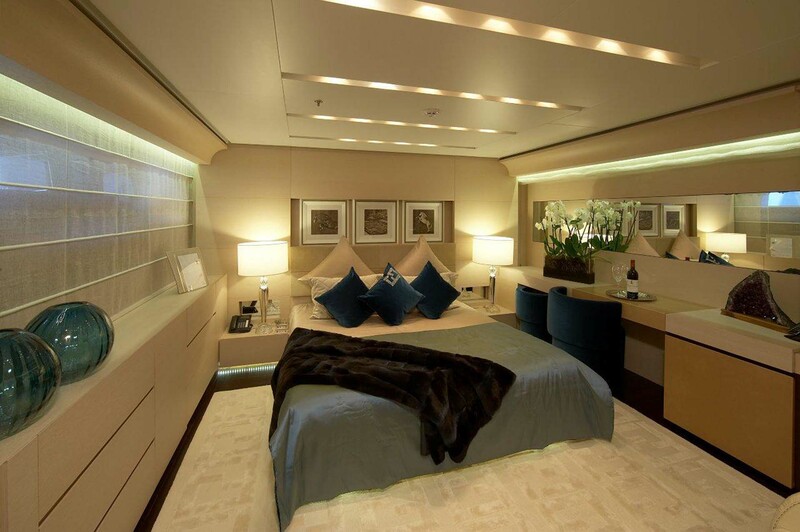 The lower deck contains the most of the guest accommodation, with the crew accommodation placed forward. 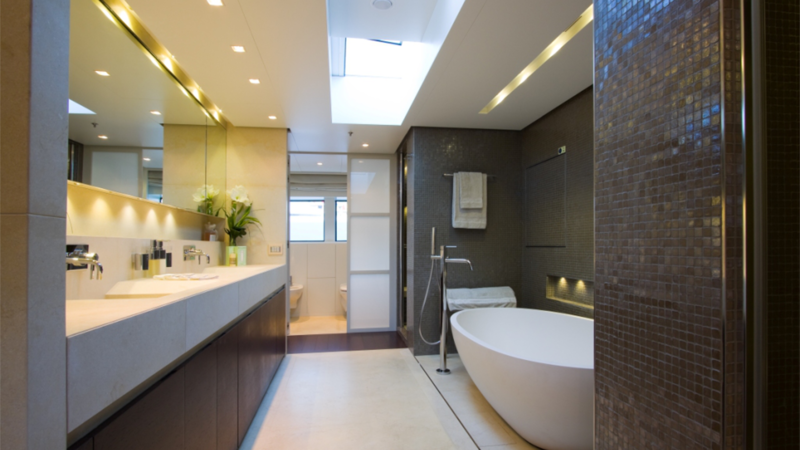 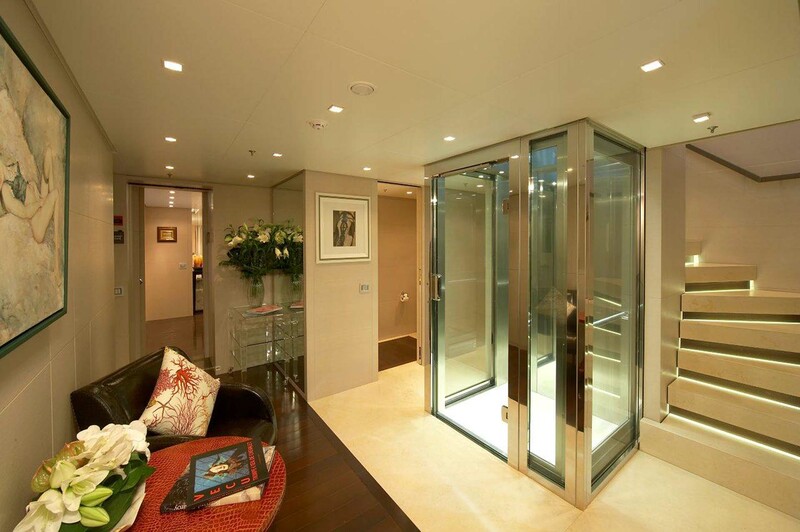 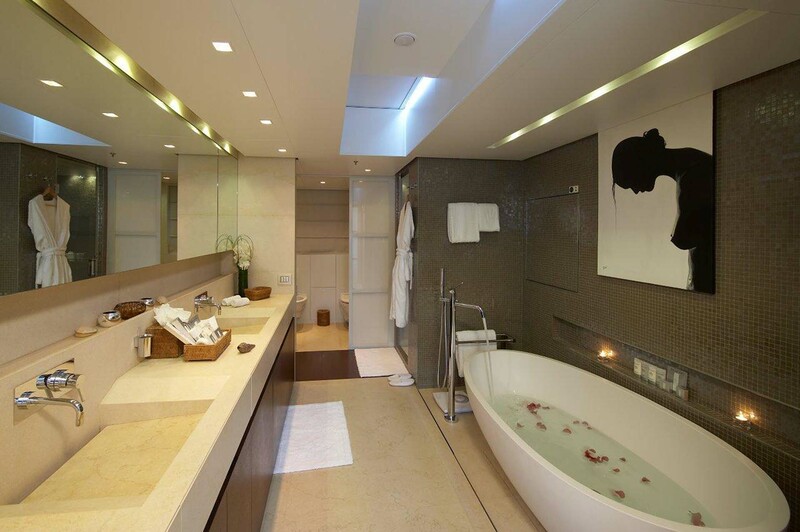 A lift/elevator connects all three decks, and on the main deck forward there is a spacious full-beam Master suite with private lounge/study, two side-terraces and an en-suite bathroom. 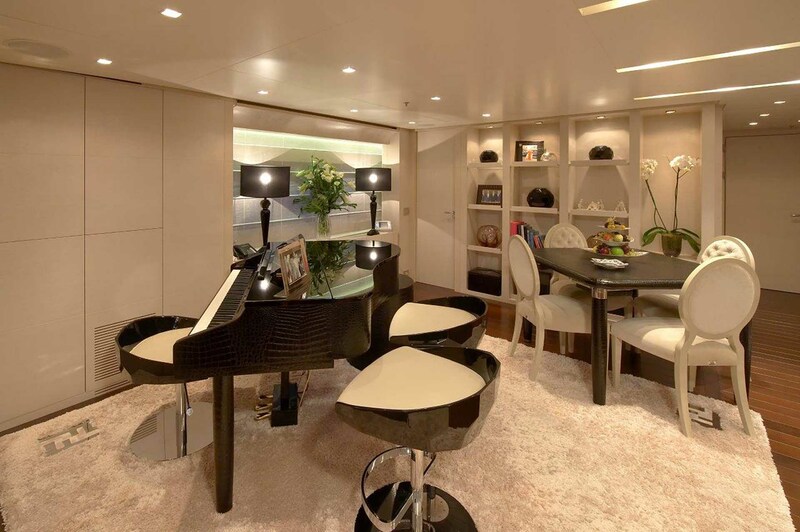 To the aft, the main salon and formal dining area share the same open-plan space, where neutral colours and contemporary styling form a bright and relaxing environment. 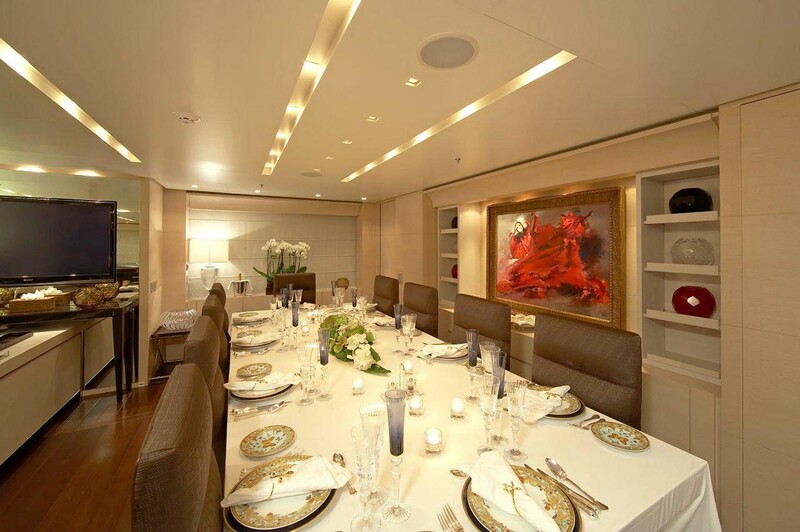 The formal dining area is able to seat up to 10 guests for a delicious family meal in air-conditioned surroundings. 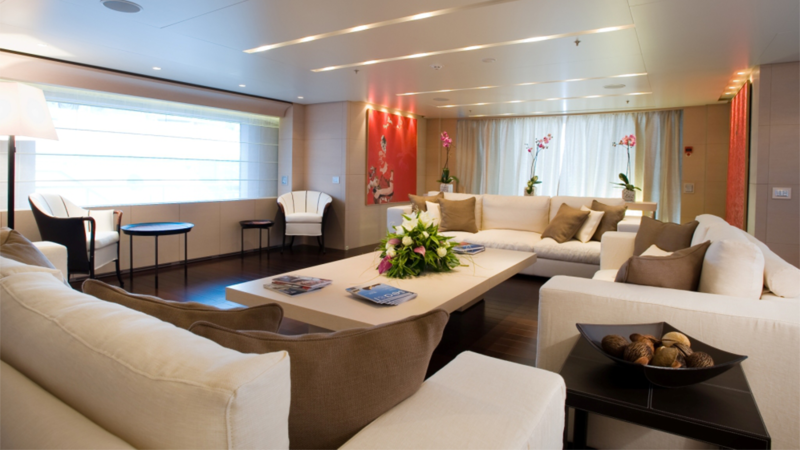 The lounge is laid out with two large sofas and armchairs with a coffee table to rest drinks. 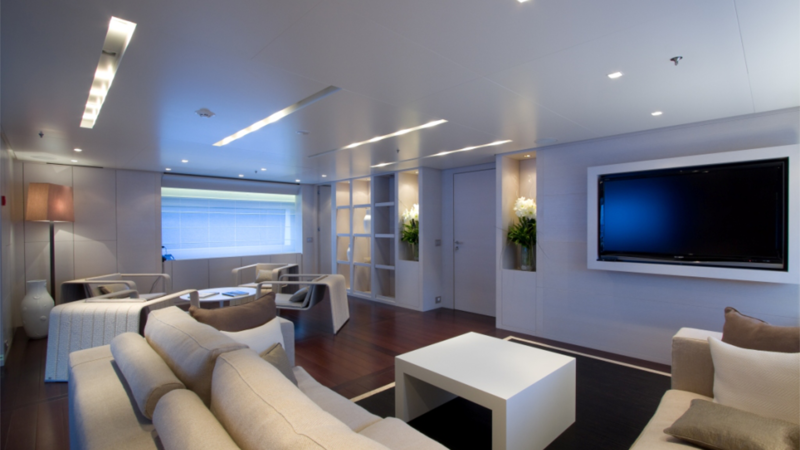 A widescreen TV is installed between the dining table and the salon to entertain regardless of where everyone is seated. 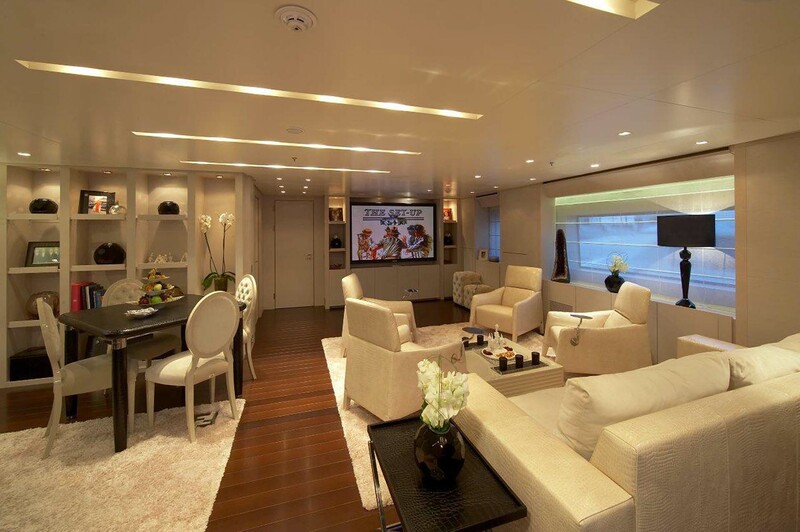 On the upper deck, the sky lounge offers a casual environment where guests can sit back and watch a film on the widescreen TV or play games while listening to live music from the grand piano. 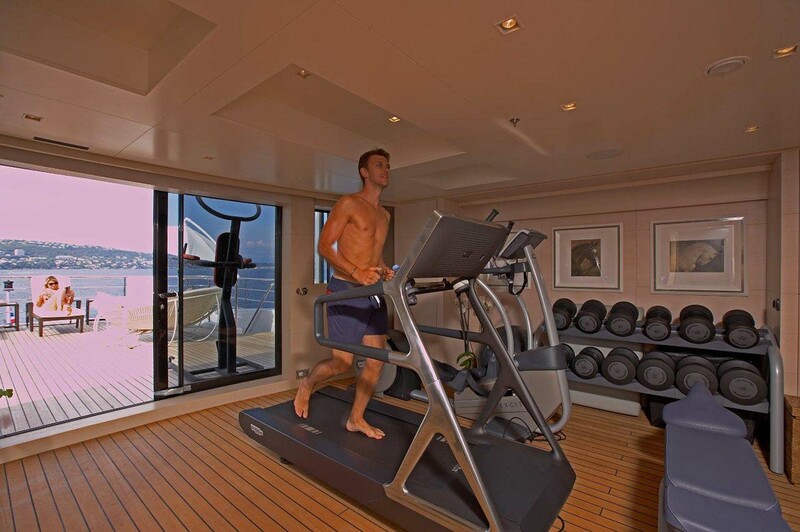 To complete the guest amenities, the sundeck has an air-conditioned gym with a range of equipment for maintaining fitness regimes. 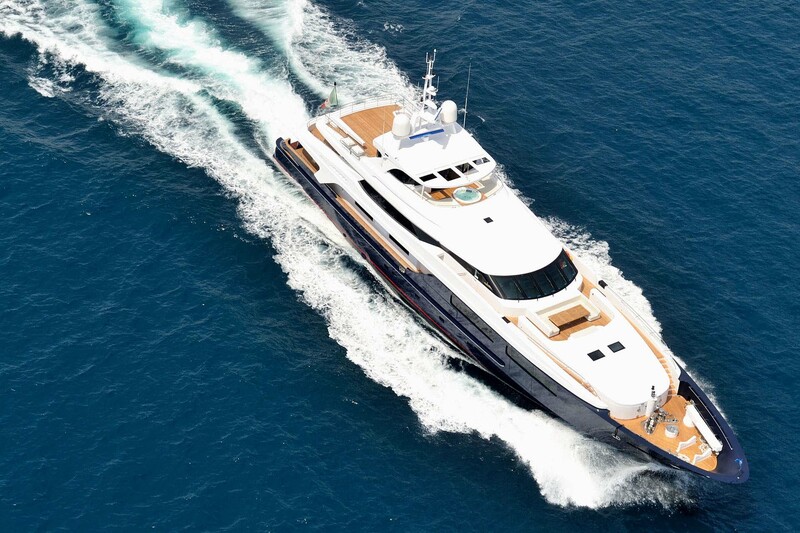 2 x Caterpillar 2000 HP engines allow for a top speed of 17 knots, a cruising speed of 16 knots and a range of 4,500 nautical miles at 12 knots. 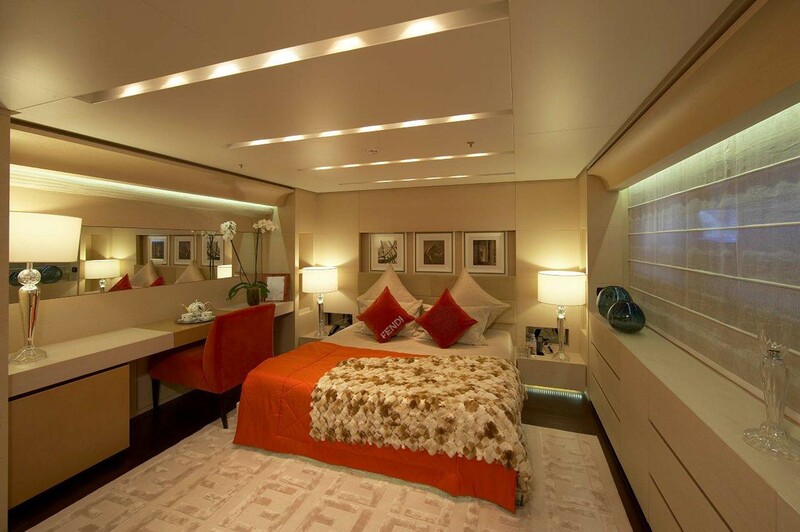 The accommodation sleeps up to 10 guests across 5 cabins: 1 Master suite, 3 double cabins and 1 twin cabin. 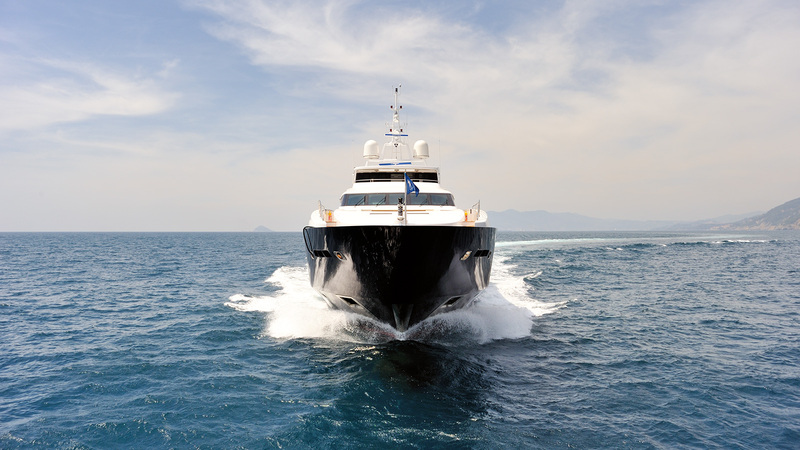 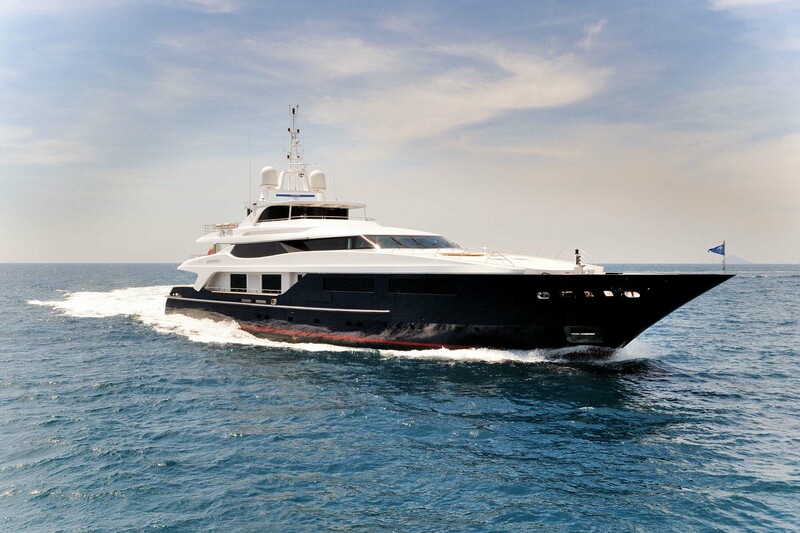 Her expert crew of 13 will ensure that everyone is well taken care of throughout the journey.